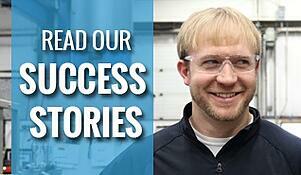 My name is Matt Moser, I work for Chemdesign Products, Incorporated in Marinette, Wisconsin. I'm a Journeyman Pipefitter and a Millwright. I work on a lot of John Crane seals for us, obviously the process piping side of it, I weld pipe, installation front to back, I got it. That's pretty much what I do. Glass repair, installations, vessel repairs, etc. I've been working wtih Crane for a couple years for sure. Every experience I have with Crane Engineering is very positive. They back up what they sell, and if they can't they'll get you the answer. If you still can't get the answer, it doesn't work quite right, they'll show up. Show them what you've got and they'll resize, rethink, re-engineer to get it right. It's a service we're not used to having. Most of the time you get it and then you're on your own. You deal with the same type of people that you see here, we always have a face with a name, it's very pleasant. It's very beneficial to us to be working with such a positive group of people that don't quit until it's running right. You can make it run, and then you can make it run right. They want it right, and that's what we need. Need it to run? Or do you need it to run right?